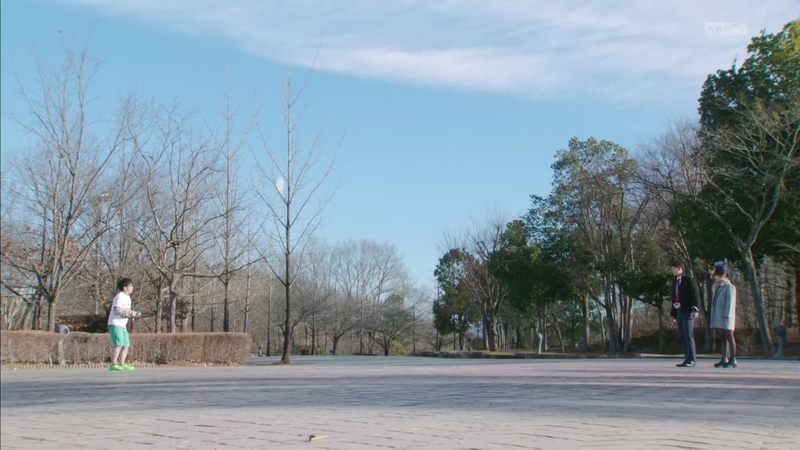 Recap: Kamen Rider Drive, Episode 20 – How Long Has Saijou Kyu Been a Roidmude? Shinnosuke, Kiriko and Gou are on their way to surprise Kyu at his book signing. But on the way, the Heaviness strikes. Gou henshins while Shinnosuke has to wait for Belt-san. He finds the Roidmude 072 on a rooftop holding some woman near the edge. Gou does his intro spiel and 072 goes wild! He loves it! He is very excited. Even more when another Kamen Rider pops in too. But doesn’t Shinnosuke also have a flashy introduction? 072 demands one. Shinnosuke comes up with something and 072 loves it. They don’t really understand what’s going, but something about 072’s way of speaking sounds very familiar to Shinnosuke. Suddenly, Roidmude 044 and 094 arrive and immediately attack 072. 072 runs and the two Roidmude attack Shinnosuke and Gou. Belt-san says these two are in the middle of evolving. 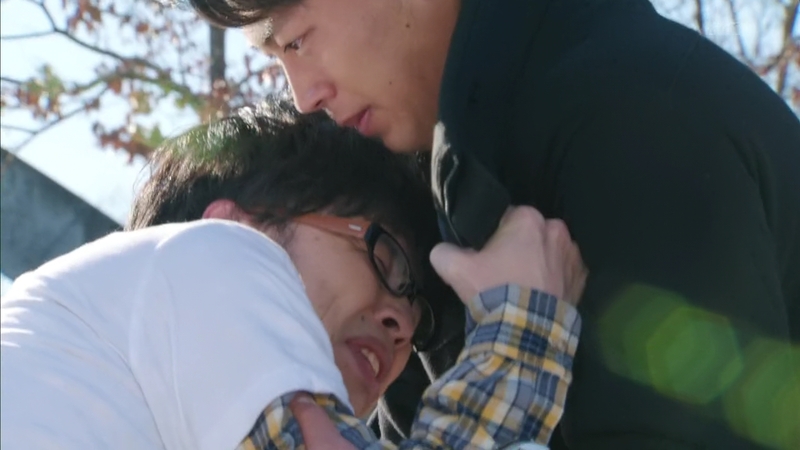 Shinnosuke goes Wild, but Gou still needs to help him, eventually driving the two Roidmude away. They rejoin Kiriko who has just found where 072 ran off to. Gou recognizes this as Kyu’s apartment. They suddenly hear arguing from inside and they barge in. Much to their shock, they find TWO Kyus! Meanwhile by the water, Medic introduces 044 and 094 to Heart as the new Reapers. She’s tasked them with the job of resetting defective Roidmudes since Chase can longer harm other Roidmudes. Heart loves it. Medic appreciates the compliments. She points out how she’s nothing like and better than Brain. Brain has been listening and he does not like it. He storms off, frustrated again by Medic. Over at the SID, they’ve dressed the two Kyus in either a black or white shirt to help tell them apart easier as they try to figure out who is the real one. Black Saijou says they’re twins. But Kiriko suggests they question them separately. Otta and Rinna are interrogating Black Saiijou. Kyu’s real name is Imai Kenta and he doesn’t have any siblings. 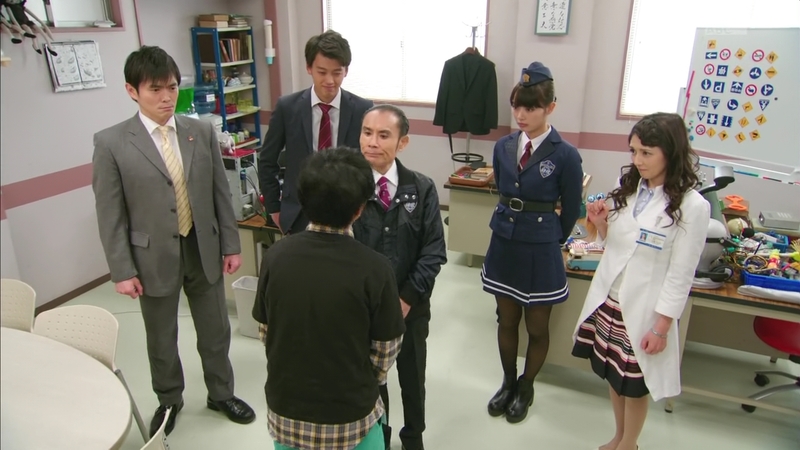 Shinnosuke and Kiriko are with White Saijou who ends up confessing. 072 copied him on New Year’s in order to look for the Kamen Rider since he was close to the SID. But 072 didn’t kill him and has been living with Kyu ever since. Sometimes, 072 even comes in to work for Kyu instead, but hasn’t found anything info on the Kamen Rider. Black Saijou has also told Otta the same story. But Shinnosuke doesn’t understand one thing. The real Kyu would’ve immediately pointed fingers at the fake one, but he hasn’t. Anyway, why would the Roidmude attack the woman earlier? White Saijou says Shinnosuke wouldn’t understand since he doesn’t watch anime. 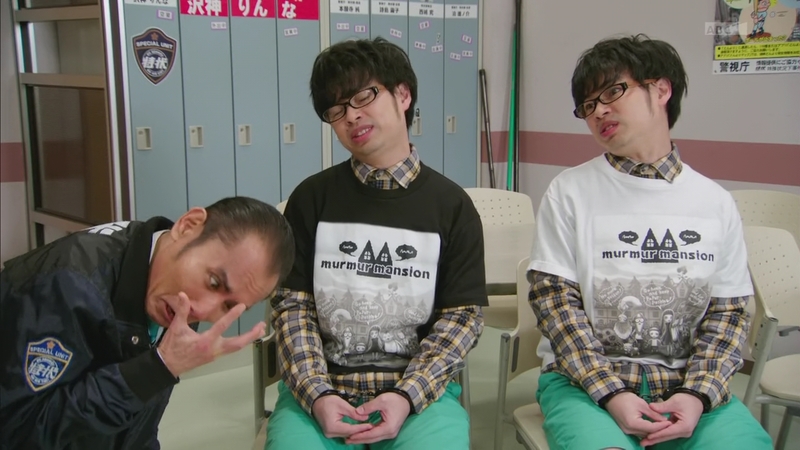 Later, Shinnosuke decides to binge watch Murmur Mansion, the anime on Kyu’s shirt. Afterwards, he is finally in top gear. The two Kyus are released next morning. Exiting the station, the Kyus are confronted by Otta in sunglasses and with a shotgun. 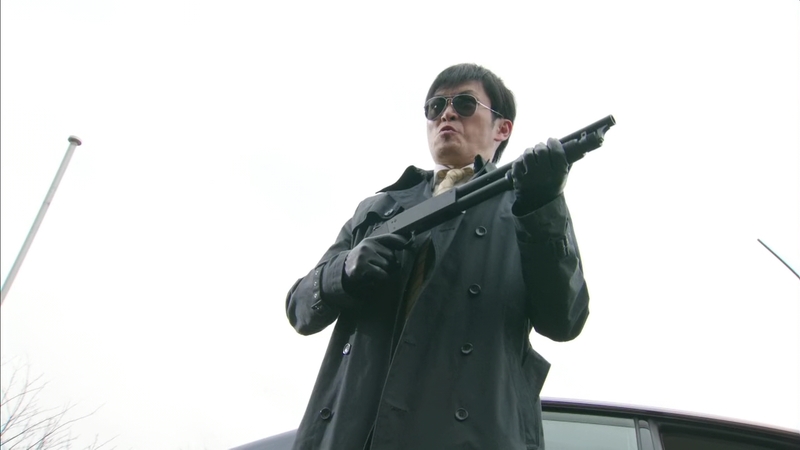 Chief Jun tries to get Otta to calm down, but it’s only a fake shotgun. Shinnosuke says it’s okay. He pulls out a commemorative plate for the start of the new Murmur Mansion. The two Kyus go crazy for it since there are only 5 in existence. But Shinnosuke knows how to use this to determine the real and fake Kyu. He tosses the plate into the air and the two Kys run. But Black Saijou trips over himself while White Saijou leaps into the air and safely catches the plate. Oops. White Saijou runs, but Shinnosuke and Kiriko cut him off. Shinnosuke admits the plate is just a replica, the Shift Cars made it themselves. 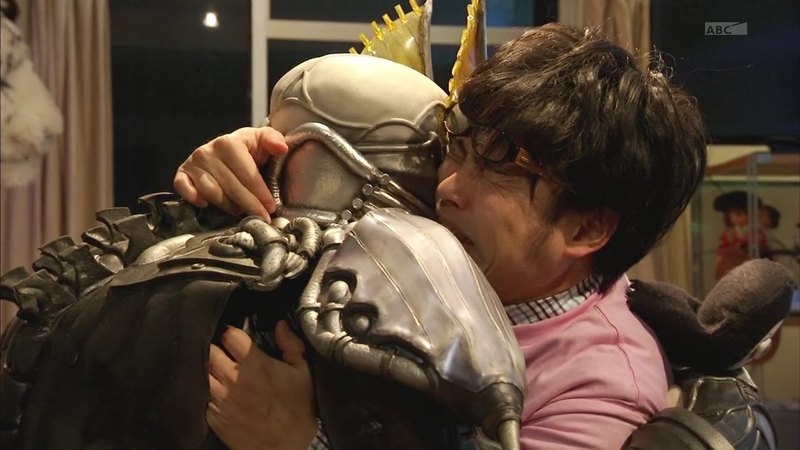 White Saijou realizes Shinnosuke is Kamen Rider Drive and he understands this is the end for him. 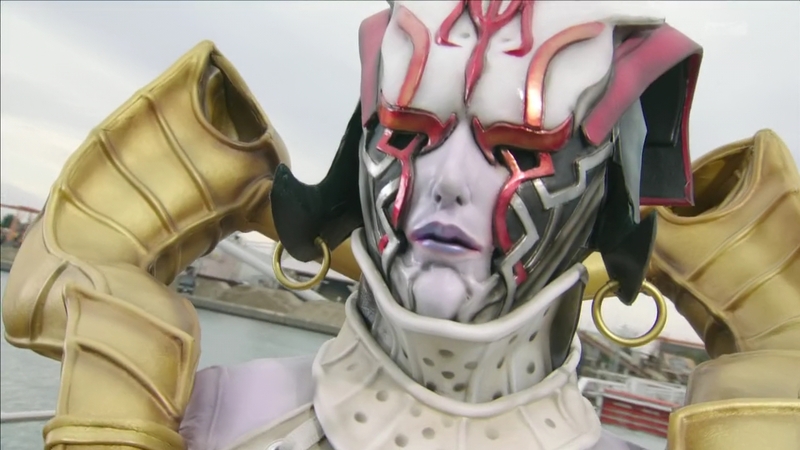 White Saijou reverts to his Roidmude form. But Shinnosuke says not so fast. All mysteries have been solved. Kyu decided on his own to allow 072 to stay with him. The real Kyu is stopping Otta from pursuing the Roidmude. Rinna tells them Shinnosuke’s hunch was right. Kyu was covering up for the Roidmude! Kyu tells them the whole story. 072 was about to get rid of him, but Kyu asked for one dying wish: That he could at least watch that night’s episode of Murmur Mansion. 072 allows Kyu to watch it. After it is over, Kyu is very emotional from the story and is happy he’s at least gotten to see it before he dies. But to his surprise, 072 has been affected by all the MaGMCMs in the episode too. They both cry. Shinnosuke continues his conclusion. Having been touched by the anime, Kyu and 072 decided they could switch with each other from time to time so they can both enjoy living with humans. Turns out, the announcement meeting of Murmur Mansion‘s movie clashed with Kyu’s book signing schedule. So Kyu and 072 decided to split up to go to both events. 072 went to the movie meeting and was so upset at one of the announcements, he caused the Heaviness and everyone to panic. 072 attacked the woman because she was the voice actress. Kiriko is not sure she understands. Shinnosuke explains that Murmur Mansion is better subtitled. So if they get another idol actress to play the part, it’ll ruin everything! Exactly! 072 says. Shinnosuke says he knows Kyu is a good person. That’s why since 072 copied Kyu, Shinnosuke does not want to assume that 072 is a bad guy. In other words, there may be Roidmude who are good. Kiriko remembers her knight Chase. Is Shinnosuke? “Are you comparing 072 to Chase?” Belt-san asks. Shinnosuke tells 072 that he wanted to talk to him first before deciding whether to defeat him or not. 072 says if it is possible, he would like to continue living like this, with Kyu and among humans. But suddenly, Medic’s damn tentacle pierces through 072 chest, causing him to drop the plate. 072 collapses and reverts to his Kyu form. Shinnosuke is incensed. Gou arrives to help. 072 pushes off Shinnosuke and Kiriko and reverts to his Roidmude form before exploding, including his Viral Core. Belt-san can sense it. “Time to go.” An enraged Shinnosuke is ready for revenge. He henshins. 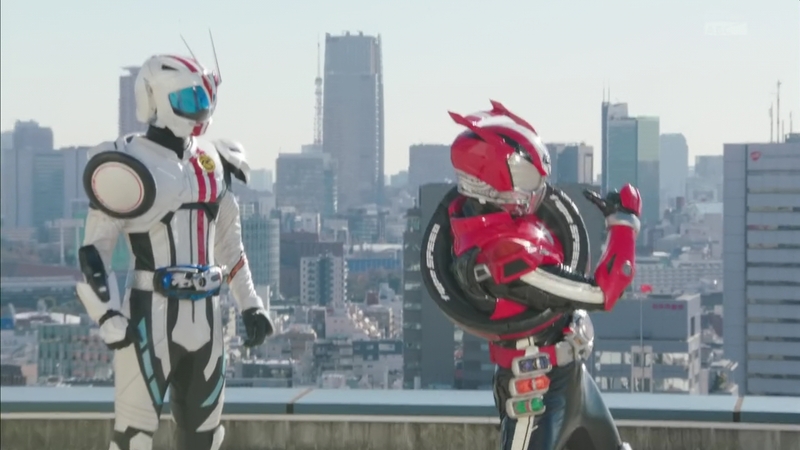 Gou fights the two Reaper Roidmudes. But he notes that they destroyed even the Viral Core. Medic explains that recently she realized that Roidmude remain defective no matter how many times they’re reset. That’s why, except for Heart-sama, herself and select Roidmude, it is more efficient to eliminate everyone. This is the new way of the Grim Reapers. Shinnosuke remembers Chase saying he does not destroy Viral Cores as he grants Roidmudes a chance to start over. Medic cannot believe what she has just been called. Shinnosuke decides to go Dead Heat. Gou takes a seat as Shinnosuke fights the two Roidmude as well as charge toward Medic. 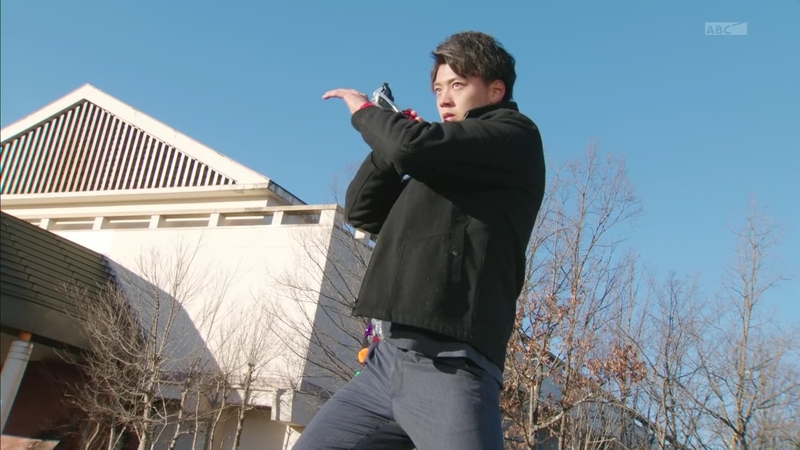 Medic starts shooting a laser beam at Shinnosuke which Belt-san says could slice through Drive’s body. Shinnosuke says he is burning up much more than that right now. He uses Max Flare to send the laser power back to Medic. He then engages a Max Flare Finisher to finish off Medic, but she uses her disgusting tentacles to grab the two Roidmudes to absorb the attack instead. This allows her to escape. 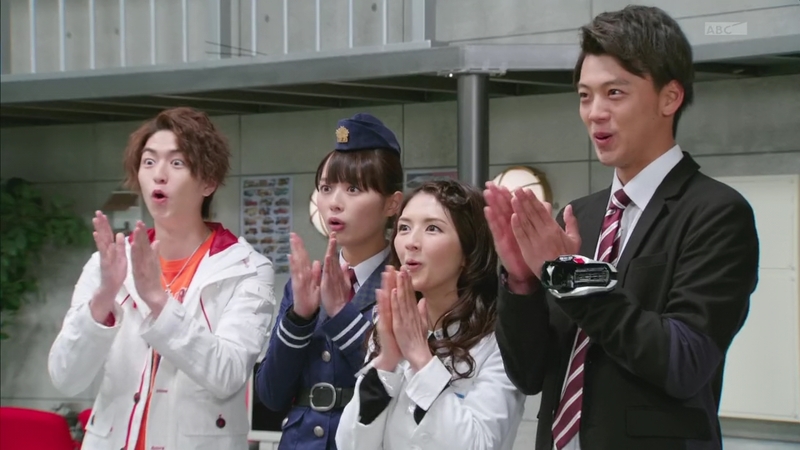 Shinnosuke lets out a scream of agony. Later at the SID, Kyu apologizes to everyone for the trouble he caused. He’s also sad that 072 ended up going crazy in the end after all. Chief Jun says that Kyu has experienced something others have not and that he can learn from this experience. While the SID gets back to their playful antics, Medic is still fuming over earlier. She has a cut on her arm. Medic morphs into her evolved Roidmude form. I really liked this episode. It was okay for Kyu, but the star was definitely Roidmude 072. I always hate when they make nice Monsters of the Week. Like either making them sympathetic or want to repent or giving them childlike voices. Things get really sad. And it definitely did here thanks to that biotch Medic. What a horrible person thing. lol I’m definitely #TeamBrain when it comes to the idol group in-fighting. Plus, 072’s story and Shinnosuke coming around on the idea of reformed or “good” Roidmude is definitely setting up the next moves in Chase’s story, yes? But was that bleeding Medic supposed to mean something? I have no idea. Anyway, I’m always a sucker for the “nice” MOTWs who are basically killed because they get caught up with the wrong crowd. (That’s a lesson for the kids out there!) That’s why I love Gokaiger‘s hopeless romantic Jealousto who gets to survive after leaving the Zangyack. I also loved Kyu’s line, “The gags are basic, but there are still many emotional scenes” or “It’s a comedy, but they still tell emotional stories.” Pretty much describes most toku, yes? I think that definitely describes many of Yasuko Kobayashi’s greatest works. And that’s pretty much why I love her work. Goofy and simple on the surface, but down deep, it’s emotional and affecting. That’s what I look for. Many a Kamen Rider season also features plenty of comedy, but ends up being grimdark by the end (to varying degrees). I wonder where Drive will end up. We’re nearing the midpoint climax! Should be exciting. 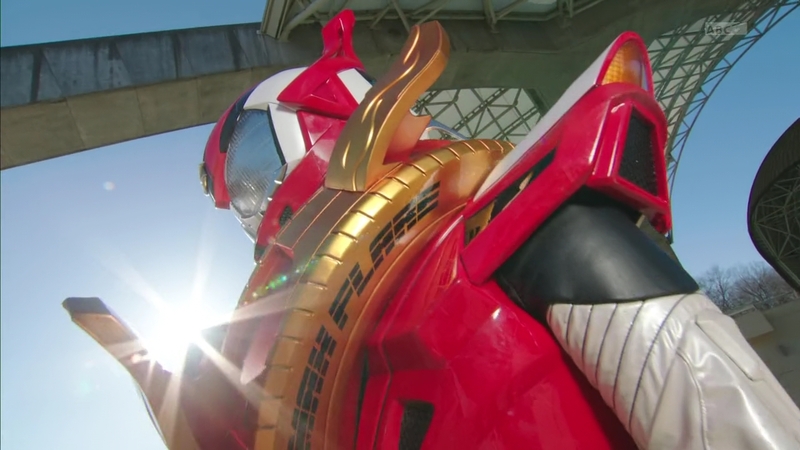 ← Recap: Power Rangers Dino Charge, Episode 5 – "You can't change the past, but you can learn from it." I am pleasantly surprised with this one as well. I was initially not expecting a lot from it, since Kyu isn’t really that much of an interesting character, but this ep turned out to be an interesting ride. This one actually feels like a reverse of the Gen-centric episode, where we got significant character insight on Otta. For this one, there isn’t really much new about kyu, but the plot definitely moved at a fast pace. And, whoa! that last part is definitely something. Correct me if I am wrong, but Medic seems to be the first Roimude to be shown actually bleeding (though Chase was shown in Ep. 10 to have a bloodied wound on his face)… From what I recall, when Heart was injured in his first major battle with Shinosuke, he was not shown bleeding anywhere and all his wounds are “mechanical” in that it was shown more like having sparks of electricity from them. So. I am guessing that Medic and Chase are possibly part-human, which might also imply that Medic is also a human-type roimude and might hint as to why that type seems to be special. Yeah! That’s what I thought too. That would definitely be interesting if there are some hybrids of some sort.